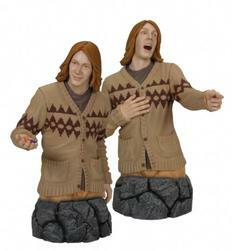 Where there's one Weasley twin the other can't be far behind. Gentle Giant Ltd. offers its Harry Potter collectors this unique 2 pack! Fred and George are up to their old shenanigans! Fred offers a treat from their Skiving Snackboxes while George laughs hysterically on the side lines.